Antiquity and shabby chic spirits are already a part of the normal scene when it comes to home decoration. We see so many of it that our minds get cluttered and overwhelmed. Well, we’re giving more of that today but in the crispest and simplest of ways. 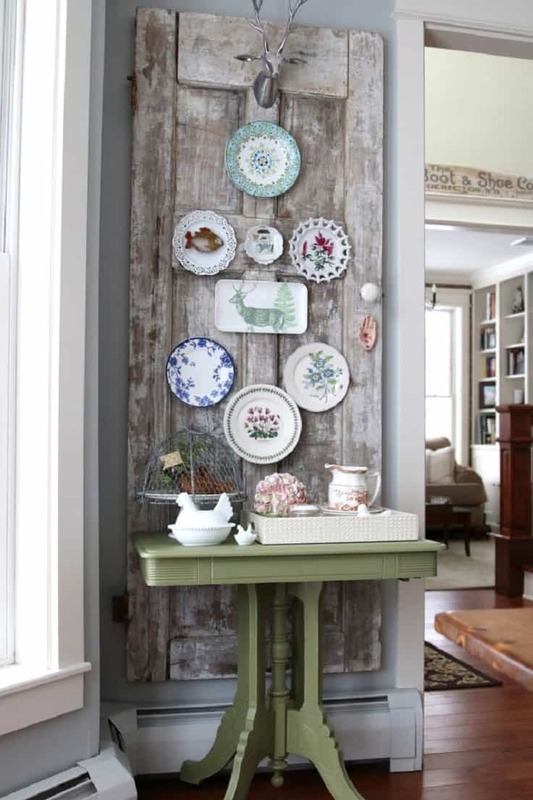 Let’s take a look at 15 vintage decor ideas that are sure to inspire and make the pickings a bit easier. Little Vintage Nest has so much inspiration to grab with its wide range of vintage-inspired home décor. Just look at this trunk that’s doubled as a coffee table for example. It’s a versatile piece that really adds some “story” to the scape of the home. This entire bedroom is a gorgeous example of how vintage decor can add so much personality and artistic quality to the home. 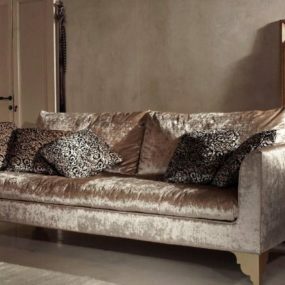 The distressed edges and the curves in all the furniture make it a feminine and eclectic way to style. We found this peek over at The Spruce and fell in love with all the varying textures. 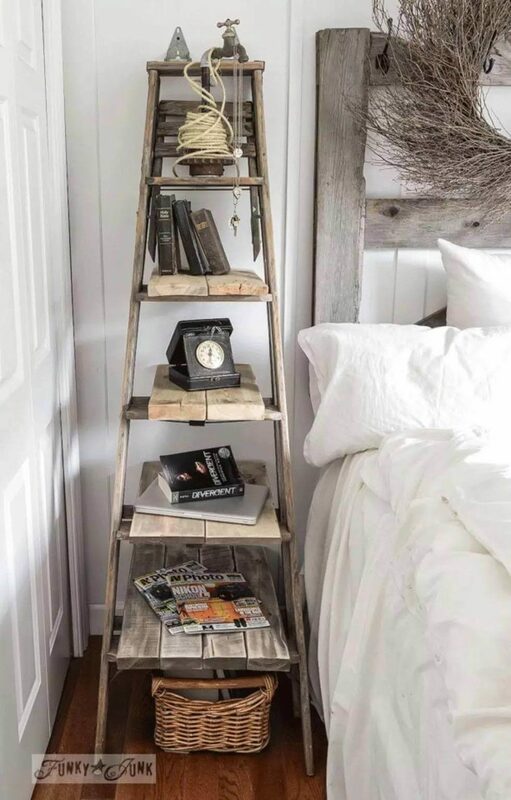 Old ladders can turn into great pieces of decor or even display shelves. Just look at this nifty setup fond over at Home BNC for instance. Easily organize your media or trinkets by using one of these finds in the corner of a bedroom, office, or living room space. 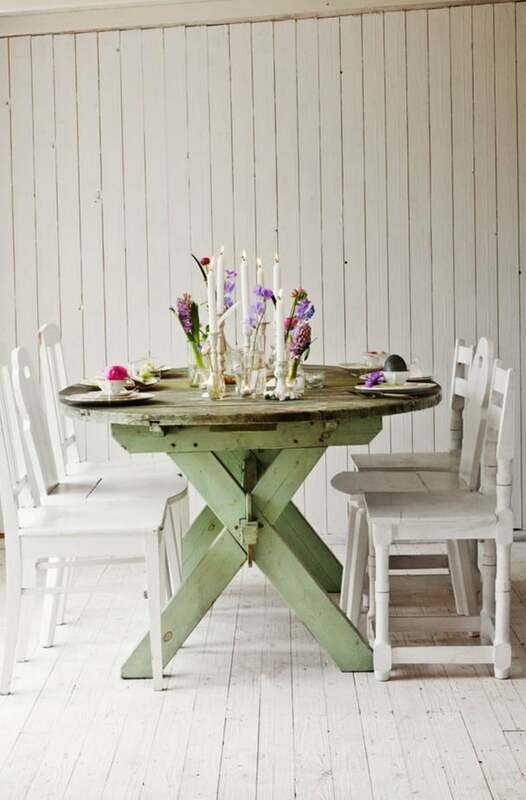 Here’s another peek at Little Vintage Nest which we can grab some major inspiration from. 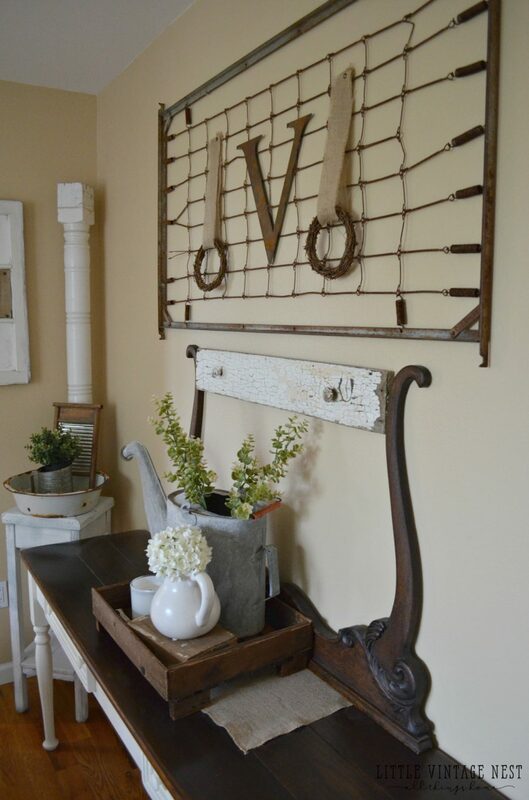 Throwback pitchers, wire hanger displays, and furniture pieces with that same, old spirit, it can be a lot of fun to mix and match these flea market-style finds. And we love how there’s a bout of fresh flowers in the mix. Scrolling through Pinterest, we stumbled upon this beautiful gallery wall of funky, vintage pieces. You can easily jazz up your staircase or hallway with the same type of design. 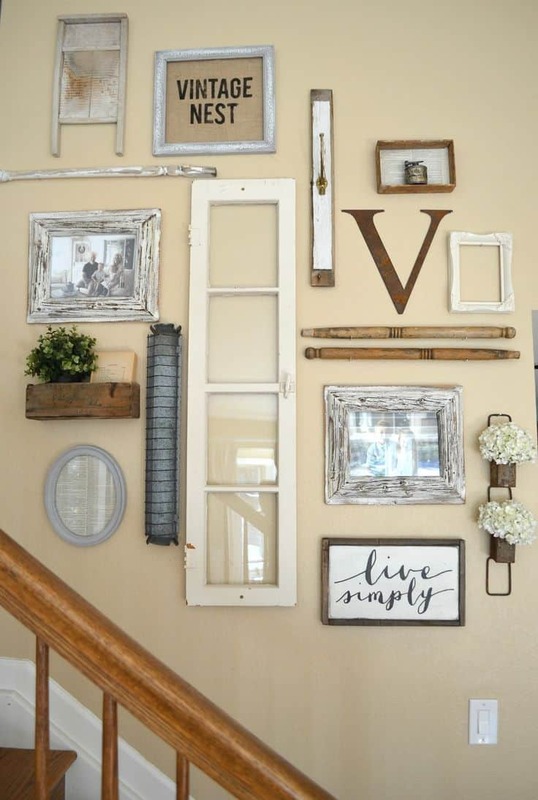 From the wooden frames to an old window, it’s a great way to get creative with some shabby chic parts. Top Inspired featured this fun little nook filled with vintage surprises as well. The hanging antique plates and all the pieces that make up the coffee bar come together quite nicely and with so much charm. It’s a good inspiration for those trying to fill space in their own kitchen. We’ve seen this fabulous DIY swirling around the web and finally caught a hold of it over at Wonderful DIY. 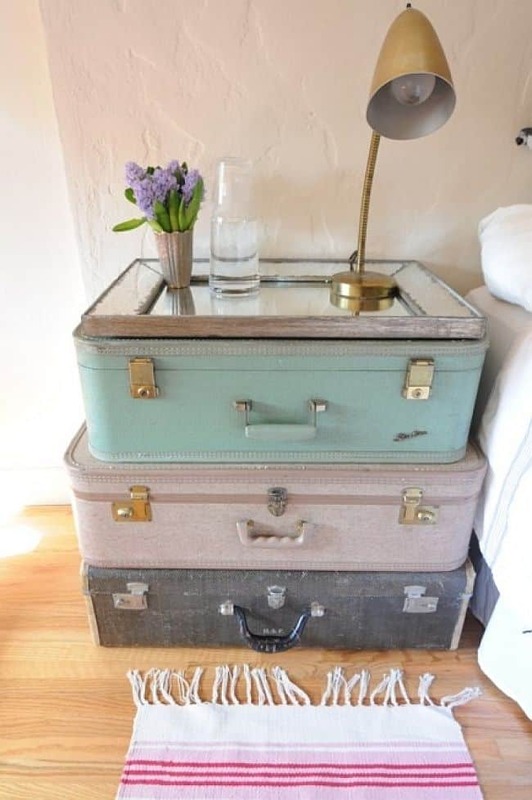 Grab some vintage suitcases and then create a side table out of them. 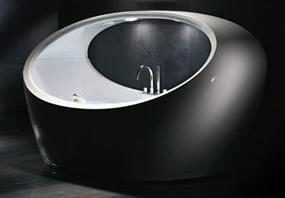 It could be in your studio apartment or your bedroom, either way it’s so much fun and quirky! 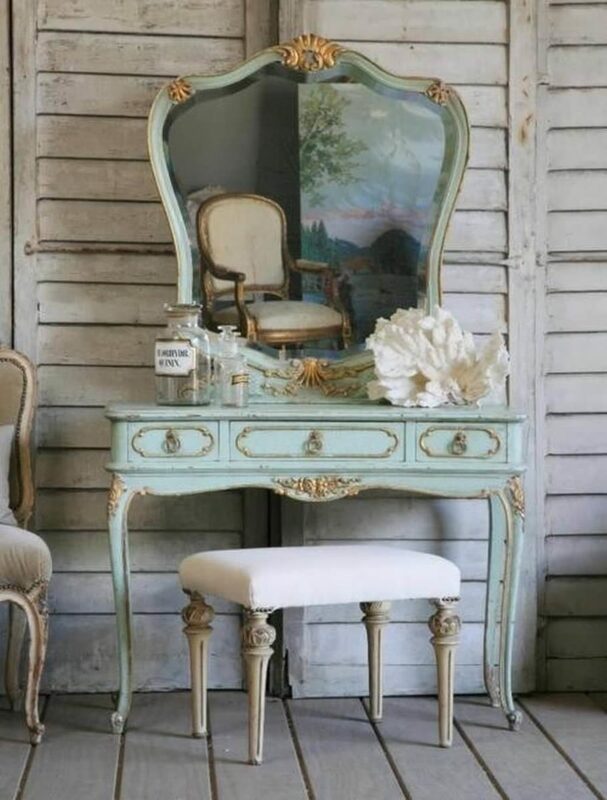 Even your vanity space can be racked with vintage style. 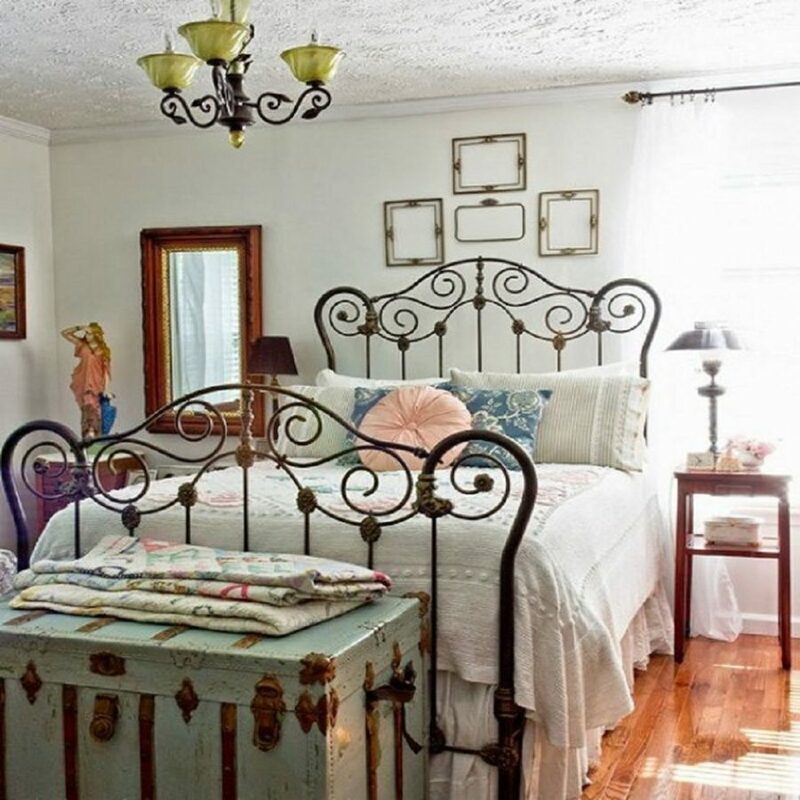 Whether you pick out furniture pieces that fit the bill to a “T” like you see here from Home BNC or you just sprinkle throwback trinkets on top, you can easily add some more antiquity to the bedroom. 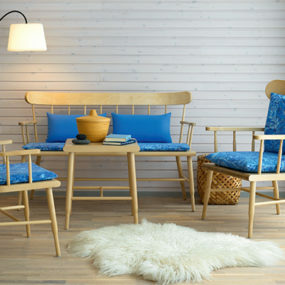 Pay attention to the stool or chair that you choose as well and have it blend nicely together. 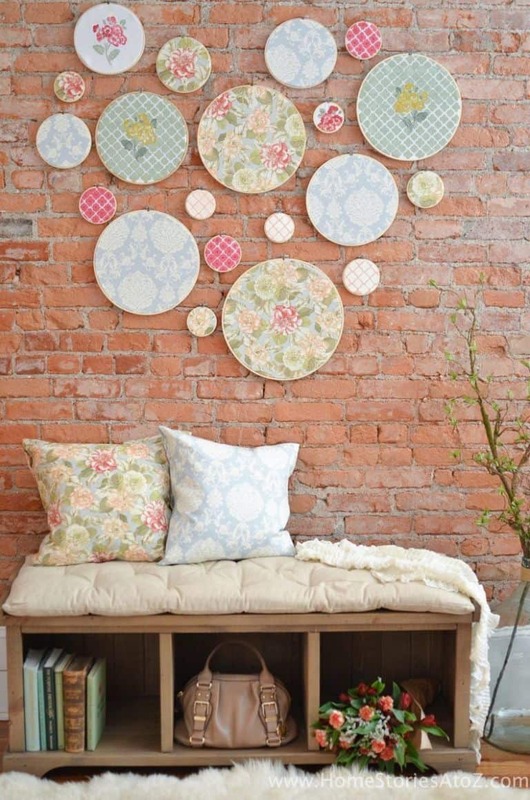 Shabby Chic has a lot of great ideas up their sleeve as well. 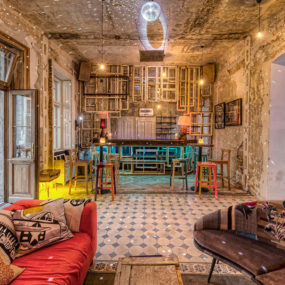 Not only is this little café corner full of charm but we love the distressed colors and design of the furniture. This is another way to go if you are trying to reroute your home into a more “cottage” type of scene. 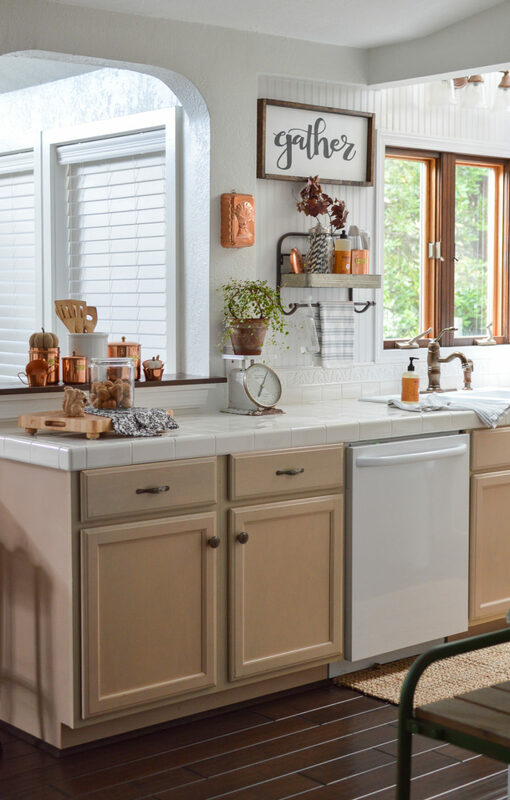 DelightFULL featured a kitchen with a lot of eclectic quality but vintage-style appliances as well. 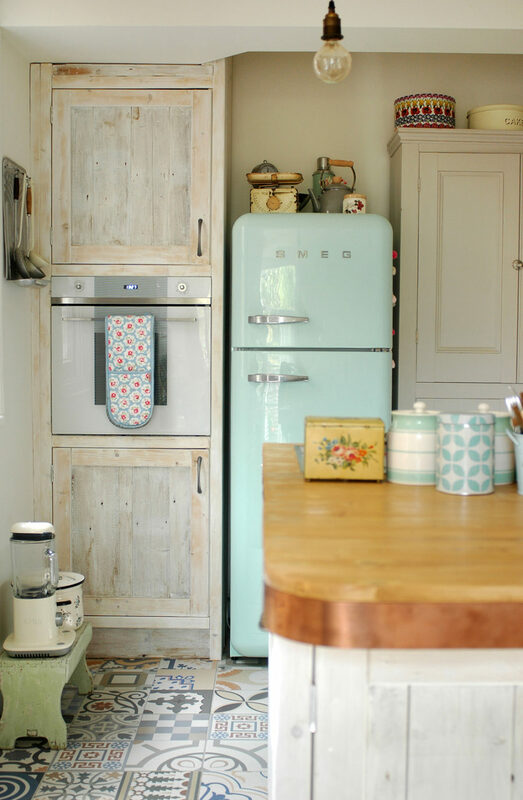 Just look at that adorable fridge and how much life and personality it brings to the space. You can easily find these while shopping, although they’ll probably be on the more expensive side. Fox Hollow Cottage has a more traditional vintage quality about it. This is something you’d see in a family home that blends both contemporary style with throwback pieces. All of those copper bits really help set the scene. 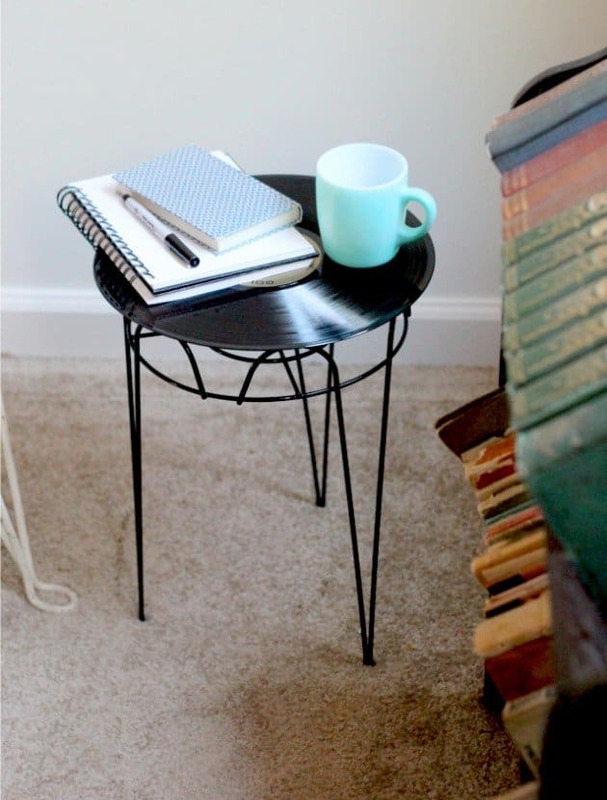 Architecture Art Designs gave us this rad, upcycled side table that we instantly fell in love with. 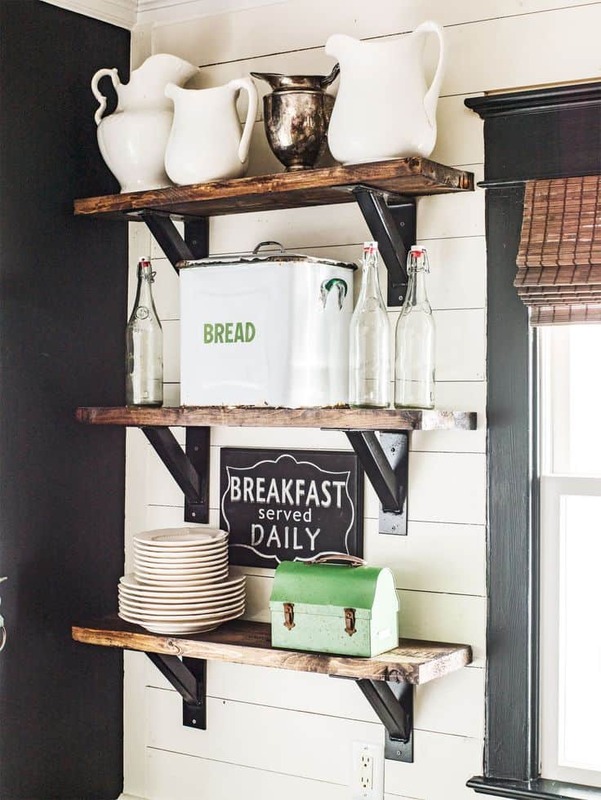 Easily a DIY that you can manage at home, grab an old vinyl and turn it into a functional piece for the home. Home offices, guest rooms, or even the movie room could hold this cutie quite nicely. Country Living Magazine had a lot for us to swoon over as well. We especially loved this little mudroom addition and all its girlish charm. Embroidery hoops bring in a sense of femininity but also that same vintage appeal as well. 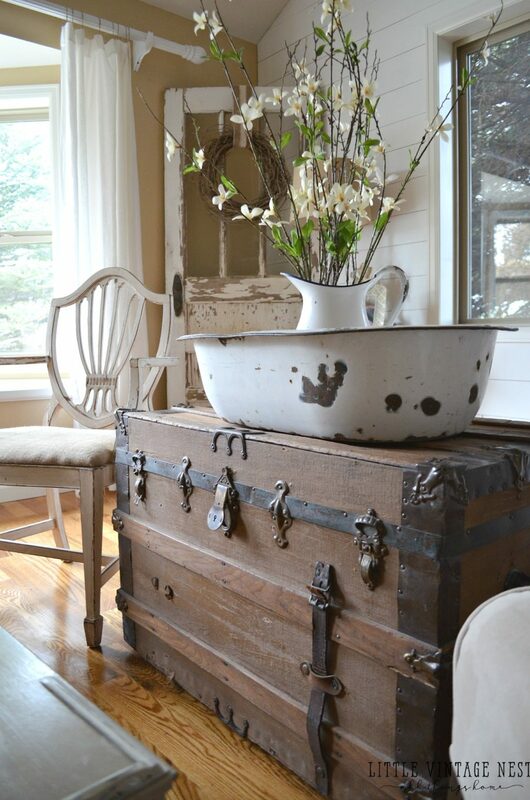 And finally, hop on over to HGTV to find other fun and surprising ways to bring vintage quality into the home. 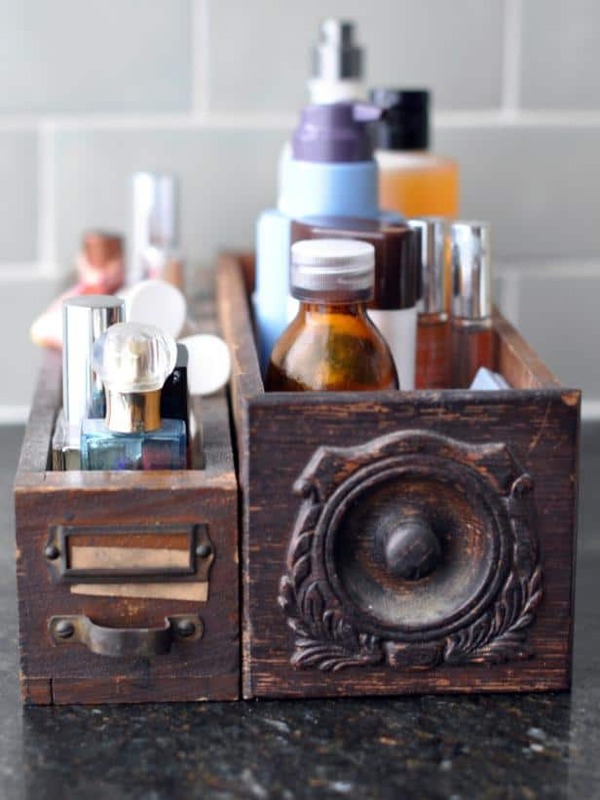 These old, wooden drawers work so nicely as organizational tools for the bathroom or home office. There’s really so many possibilities.